Haven’t decided on a hotel yet? 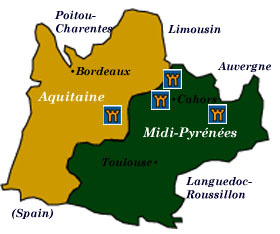 You can look at other available hotels in the regions of Aquitaine and Midi Pyrénées with Booking.com. If you are interested in staying in a villa in Aquitaine, Booking.com offers a number of stunning properties. If you love history, magnificent scenery, and exquisite food, southwest France tops any list. You can step into the world’s first art galleries—caves decorated 15,000 years ago with bison, deer, and mammoths—or immerse yourself in the history of the Hundred Years’ War, fought between the English and the French over the rich lands of legendary Aquitaine. If you enjoy exploring abandoned castles and prehistoric caves, strolling through medieval bastide towns, visiting antique shops, and driving on uncrowded roads (ok, not in August) through peaceful rolling hills, this enchanting region is just the place. Create a vacation highlight by stopping along a riverbank and indulging on a picnic of fresh local pâté de fois gras, truffles, with a glass of divine Bordeaux, of course! The Dordogne This magical area of France literally overflows with romance, storybook castles and villages, and archaeological wonders. The most charming towns? Sarlat-la-Caneda features the highest concentration of medieval, Renaissance, and 17th-century façades in all of France, which form an outdoor museum protected by law, and a fantastic food market on Wednesdays; Rocamadour, defying gravity by its precipitous situation on a sheer cliff, pilgrims still come as they have for over 800 years to visit the shrine at the Cité Religieuse. Slightly less touristed, Cahors dates back 2000 years and is famous for its truffles and fine wine. Beaulieu-sur-Dordogne is a lovely little town known for its majestic abbey-church and nearby walking trails. Interesting bastide towns (a bastide is a type of fortified town) are Monpazier, Castelnau de Montmiral, and Monflanquin. The best of many magnificent castles are Château de Bonaguil, Château de Bourdeilles, Château de Castelnau-Bretenoux, Château de Castelnaud, and Château de Beynac. Fascinating prehistoric sites of the Vallée de la Vézère, which is a UNESCO World Heritage Site, open to the public are Grotte de Font-de-Gaume, Grotte de Combarelles, Abri du Cap Blanc, Grotte du Grand Roc, and to the northeast, Grotte de Lascaux (Lascaux II). The Wine District of Bordeaux The world’s largest fine wine region, over 44 million cases of wine are produced every year. Many châteaux welcome visitors for a tour and wine tasting, but you can’t just show up. You’ll need to make reservations first. Go to the links page at the left for further information. One of the most charming towns of the district is St-Émilion. Steep cobble-stoned streets pass by wine shops installed in buildings of golden stone. The town’s ramparts take you to the Château du Roi, built by the English during the reign of Henry III in the 13th century. La Côte Basque Famed playground for the rich and famous of the 19th century, Biarritz now sports some of the best surfing in Europe. Promenading past the summer home of Napoleon III’s Empress Eugénie, now the elegant Hôtel de Palais, is still fashionable. Founded by the Romans and favored by the English in the Middle Ages, the fortifications of Bayonne are certainly worth a look. The city gave its name to the “bayonet,” which was developed here in the 17th century. Don’t miss sampling Bayonne’s chocolate, a specialty that was introduced by Jews fleeing Spain in the 15th Century. The little fishing village of St-Jean de Luz is famed for its handsome Basque church of Eglise St-Jean Baptiste, site of the historical wedding of Louis XIV and Spain’s Infanta María Teresa in 1660. The Pyrenees Cutting across southwest France from the Atlantic to the Mediterranean, the soaring Pyrenees offer outdoor enthusiasts outstanding hiking, fishing, and camping. The Parc National des Pyrénées can boast of some of the most exhilarating scenery of Europe. Snowcapped peaks look down upon meadows filled with a rich variety of wildlife, birds, and butterflies. There are two noteworthy towns that should be visited: Pau, former home of King Henri IV, is a lively town filled with Belle Époque architecture. The 16th-century residence of Marguerite d’Angoulème, sister of the king of France, is the Château de Pau (don’t miss the Gobelin tapestries). Lourdes is one of Europe’s great shrines. Those of faith visit the Grotte Massabielle, the cave where visions of the Virgin appeared to Bernadette Soubirous in 1858. Toulouse Capital of old Langedoc, Toulouse was once one of Europe’s wealthiest cities. Now, this fine city makes it mark as the headquarters of France’s Center for Space Research and Airbus. Historical landmarks abound, however. The Basilique St-Sernin, is the finest Romanesque church in Europe, and the Eglise des Jacobins is the largest monastery (Dominican) complex in France. If you wish to leap into the future, pay a visit to the Cité de l’Espace, a fascinating space museum with lots of interactive exhibits. Albi Sometimes called the “red city” after the shade of its brick buildings, two worthy sites demand a visit. The Musée de Toulouse-Lautrec is installed in a 13th-century fortified structure, which contains 600 works of the artist. Dominating Albi, the Cathédrale Ste-Cécile was built following the Albigensian crusade in 1265. With its ramparts and parapets, it resembles a fortress more than a place of worship; it’s now been designated a UNESCO World Heritage Site.